Acceptance of Terms. You acknowledge that you have read the terms and conditions of use and that you accept the terms thereof. YOU AGREE TO READ THESE TERMS AND CONDITIONS OF USE CAREFULLY BEFORE USING THIS COMPANY WEB SITE. If you do not agree to these terms and conditions of use, you may not access or otherwise use this Company Web Site. Right to Monitor and Disclose. Company may monitor your use of this Company Web Site, and may freely use and disclose any information and materials received from you or collected through your use of the Company Web Site for any lawful reason or purpose. Right to Change Agreement. Company reserves the right, at its sole discretion, to change, modify, add or remove any portion of this Agreement, in whole or in part, at any time. Notification of changes in the Agreement will be posted on the Company Web Site. Copyright. The Company Web Site is protected by copyright as a collective work and/or compilation, pursuant to U.S. copyright laws, international conventions, and other copyright laws. The contents of the Company Web Site are only for your personal, non‑commercial use. All materials contained on the Company Web Site are protected by copyright, and are owned or controlled by Company or the party credited as the provider of the Content. You will abide by any and all additional copyright notices, information, or restrictions contained in any Content on the Company Web Site. You may download and make copies of the Content and other downloadable items displayed on this Company Web Site for personal, noncommercial use only, provided that you maintain all copyright and other notices contained in such Content. Copying or storing of any Content for other than personal, noncommercial use is expressly prohibited without the prior written permission from Company or the copyright holder identified in the individual Con­tents copyright notice. Right to Change Content. Company may change, suspend or discontinue any aspect of the Company Web Site at any time, including the availability of any Company Web Site feature, database, or Content. Company may also impose limits on certain features and services or restrict your access to parts or all of the Company Web Site without notice or liability. User’s Representations and Warranties. You represent, warrant and covenant that: (a) you shall not upload, post or transmit to or distribute or otherwise publish through the Company Web Site any materials which (i) restrict or inhibit any other user from using and enjoying the Company Web Site, (ii) are unlawful, threatening, abusive, libelous, defamatory, obscene, vulgar, offensive, pornographic, profane, sexually explicit or indecent, (iii) constitute or encourage conduct that would consti­tute a criminal offense, give rise to civil liability or otherwise vio­late law, (iv) violate, plagiarize or infringe the rights of third parties including, without limitation, copyright, trademark, patent, rights of privacy or publicity or any other proprietary right, (v) contain a virus or other harmful component, (vi) contain any information, software or other material of a commercial nature, (vii) contain ad­vertising of any kind, or (viii) constitute or contain false or mislead­ing indications of origin or statements of fact; and (b) that you are at least eighteen (18) years old. Indemnification. You hereby agree to indemnify, defend and hold Company, and all its officers, directors, owners, agents, employees, informa­tion providers, affiliates, licensors and licensees (collectively, the “Indemnified Parties”) harmless from and against any and all liabil­ity and costs incurred by the Indemnified Parties in connection with any claim arising out of any breach by you of the Agreement or the foregoing representations, warranties and covenants, including, without limitation, attorneys fees and costs. You shall cooperate as fully as reasonably required in the defense of any claim. Company reserves the right, at its own expense, to assume the exclusive de­fense and control of any matter otherwise subject to indemnification by you and you shall not in any event settle any matter without the written consent of Company. Disclaimer for Third-Party Sites. The Company Web Site contains links and pointers to the other related World Wide Web Internet sites, resources, and spon­sors of the Company Web Site. Links to and from Company Web Site to other third party sites, maintained by third parties, do not constitute an endorsement by Company or any of its subsidiaries or affiliates of any third-party resources, or their contents. Disclaimer for Site Content. Company does not represent or endorse the accuracy or reli­ability of any advice, opinion, statement, or other information dis­played or distributed through the Company Web Site. You acknowledge that any reliance upon any such opinion, advice, state­ment, memorandum, or information shall be at your sole risk. Com­pany reserves the right, in its sole discretion, to correct any errors or omissions in any portion of the Company Web Site. Disclaimer for Third-Party Content on this Site. Company does not and cannot review all materials posted to the Company Web Site by users, and Company is not responsible for any such materials posted by users. However, Company re­serves the right at all times to disclose any information as necessary to satisfy any law, regulation or government request, or to edit, re­fuse to post or to remove any information or materials, in whole or in part, that in Company’s sole discretion are objectionable or in violation of this Agreement. Disclaimer of Warranties. THE COMPANY WEB SITE, INCLUDING ALL CON­TENT, SOFTWARE, FUNCTIONS, MATERIALS AND INFOR­MATION MADE AVAILABLE ON OR ACCESSED THROUGH THE COMPANY WEB SITE, IS PROVIDED “AS IS.” TO THE FULLEST EXTENT PERMISSIBLE BY LAW, COMPANY AND ITS SUBSIDIARIES AND AFFILIATES MAKE NO REPRE­SENTATION OR WARRANTIES OF ANY KIND WHATSO­EVER FOR THE CONTENT ON THE COMPANY WEB SITE OR THE MATERIALS, INFORMATION AND FUNCTIONS MADE ACCESSIBLE BY THE SOFTWARE USED ON OR AC­CESSED THROUGH THE COMPANY WEB SITE, FOR ANY PRODUCTS OR SERVICES OR HYPERTEXT LINKS TO THIRD PARTIES OR FOR ANY BREACH OF SECURITY AS­SOCIATED WITH THE TRANSMISSION OF SENSITIVE IN­FORMATION THROUGH THE COMPANY WEB SITE OR ANY LINKED SITE. FURTHER, COMPANY AND ITS SUB­SIDIARIES AND AFFILIATES DISCLAIM ANY EXPRESS OR IMPLIED WARRANTIES, INCLUDING, WITHOUT LIMITA­TION, NON‑INFRINGEMENT, MERCHANTABILITY OR FIT­NESS FOR A PARTICULAR PURPOSE. COMPANY DOES NOT WARRANT THAT THE FUNCTIONS CONTAINED IN THE COMPANY WEB SITE OR ANY MATERIALS OR CON­TENT CONTAINED THEREIN WILL BE UNINTERRUPTED OR ERROR FREE, THAT DEFECTS WILL BE CORRECTED, OR THAT THE COMPANY WEB SITE OR THE SERVER THAT MAKES IT AVAILABLE IS FREE OF VIRUSES OR OTHER HARMFUL COMPONENTS. COMPANY AND ITS SUBSIDIARIES AND AFFILIATES SHALL NOT BE LIABLE FOR THE USE OF THE COMPANY WEB SITE, INCLUDING, WITHOUT LIMITATION, THE CONTENT AND ANY ERRORS CONTAINED THEREIN. License to Company. By posting messages, uploading files, inputting data or en­gaging in any other form of communication (individually or collec­tively “Communications”) to the Company Web Site, you hereby grant to Company a perpetual, worldwide, irrevocable, unrestricted, non‑exclusive, royalty free license to use, copy, license, sublicense, adapt, distribute, display, publicly perform, reproduce, transmit, modify, edit and otherwise exploit such Communications, in all media now known or hereafter developed. You hereby waive all rights to any claim against Company for any alleged or actual in­fringements of any proprietary rights, rights of privacy and public­ity, moral rights, and rights of attribution in connection with such Communications. Acknowledgment of Nonconfidential Communications. You acknowledge that transmission to and from this Com­pany Web Site are not confidential and your Communications may be read or intercepted by others. You acknowledge that by submit­ting Communications to Company, no confidential, fiduciary, con­tractually implied or other relationship is created between you and Company other than pursuant to this Agreement. Choice of Law and Jurisdiction. THIS AGREEMENT SHALL BE GOVERNED BY AND CONSTRUED IN ACCORDANCE WITH THE LAWS OF THE STATE OF MISSOURI, WITHOUT REGARD TO CONFLICTS OF LAWS PROVISIONS. SOLE AND EXCLUSIVE JURISDIC­TION FOR ANY ACTION OR PROCEEDING ARISING OUT OF OR RELATED TO THIS AGREEMENT SHALL BE AN AP­PROPRIATESTATE OR FEDERAL COURT LOCATED IN THE STATE OF MISSOURI. Entire Agreement; Statute of Limitations; Severability. This Agreement constitutes the entire agreement between Company and you with respect to your use of the Company Web Site. Any cause of action you may have with respect to your use of the Company Web Site must be commenced within one (1) year after the claim or cause of action arises. If for any reason a court of competent jurisdiction finds any provision of the Agreement, or portion thereof, to be unenforceable, that provision shall be en­forced to the maximum extent permissible so as to effect the intent of the Agreement, and the remainder of this Agreement shall con­tinue in full force and effect. Company disclaims any and all re­sponsibility for content contained in any third party materials pro­vided through links from the Company Internet site. PRAYERS FOR A SOLEMN & GRACE-FILLED GOOD FRIDAY TO ALL OF OUR FRIENDS! 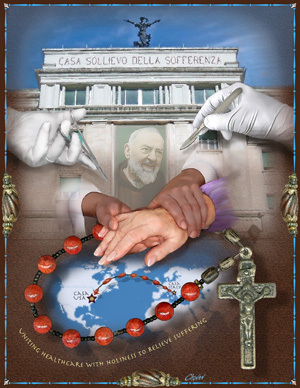 CASA USA – Quote of the Day Padre Pio, his inspired hospital, & our collaboration..
Our Episcopal Advisor Cardinal Burke calls on Church leaders to speak out in Truth. Pray for him and those attending the Summit in Rome.